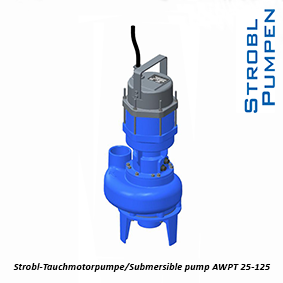 The submersible waste- and sewage water pump AWPT 50-125 covers many professional applications in the field of pumps such as drainage, dewatering, sewage pumping or emergency drainage. The pump unit is universal and can be used in many applications even for abrasive liquids such as sludge or sand mixtures. The pump can be offered with a three phase motor from 0,37 kW to 3 kW at 400 V-50 Hz or from 0,44 kW to 3,6 kW at 460 V-60Hz as well as single phase motor. As variants we can offer the submersible pump with a single screw diagonal impeller “D” as well as an open 2-Channel impeller “K2”. Cable length: 10 m, special cable length and connectors on request! Material: Casing parts in grey cast iron/ductile cast iron , impeller in grey cast iron/ductile cast iron, special material on request!